After months of intense negotiations, the President signed the “Tax Cuts And Jobs Act Of 2017” (the “New Law”) on December 22, 2017 – the most significant tax reform since 1986! It is no overstatement to say that this mammoth tax bill will have a significant impact on virtually every business and individual. Generally starting in 2018, the New Law: Reduces income tax rates for the vast majority of individual taxpayers; Substantially increases the standard deduction; Reduces or eliminates altogether certain itemized deductions; Expands or modifies certain child and dependent tax incentives; Modifies certain tax incentives for education costs; Restricts or eliminates certain employee tax-free fringe benefits; Eliminates the alternative minimum tax for corporations; Doubles the estate tax exemption; Significantly reduces the corporate tax rate; Provides for more rapid business write-offs for capital expenditures; Reduces the tax burden on owners of pass‑through business entities (e.g., proprietorships, partnerships, LLCs, S corporations); and much more. This letter highlights tax changes in the New Law we believe will have the greatest impact on our individual and business clients. The New Law’s legislative text exceeds 400 pages. Consequently, this letter highlights only selected changes. If you have questions concerning other provisions in the New Law not discussed in this letter, please call our office for details. Also, we suggest you call our firm before implementing any tax planning technique discussed in this letter. You cannot properly evaluate a particular planning strategy without calculating your overall tax liability with and without that strategy. This letter contains ideas for Federal income tax planning only. State income tax issues are not addressed. We list below selected changes under the New Law that we believe will have the greatest impact on individual taxpayers. Please note that each of the changes below impacting “individual” taxpayers will generally be first effective in 2018 and will sunset after 2025 (unless we indicate otherwise). Changes In The Individual Income Tax Rates. Your so-called “ordinary” income (e.g., compensation, interest income, most retirement income, and net short-term capital gains) is taxed at increasing tax rates that apply to different ranges of income. Under prior law, there were seven “ordinary” income tax rates as follows: 10%, 15%, 25%, 28%, 33%, 35%, and 39.6%. Starting in 2018, although the New Law retains seven ordinary income tax brackets, it changes the rates as follows: 10%, 12%, 22%, 24%, 32%, 35%, and 37%. Observation. Although the New Law lowers the actual tax rates at most income levels (regardless of filing status), determining the overall tax impact on a particular individual or family as compared to prior law will vary due to other changes in the New Law, such as: an increase in the standard deduction, loss of personal and dependency exemptions, the elimination or limitation of certain itemized deductions, increases in the child tax credit, higher income phase-outs for the child credit, a new credit for certain qualifying dependents, and others. Minor Changes In The Tax Rates For Long-Term Capital Gains And Qualified Dividends. Starting in 2018, the New Law retains the same 0%, 15%, and 20% rates that apply for 2017 to long-term capital gains and qualified dividends. Under the New Law, the 0%, 15%, and 20% rates apply at income levels similar to prior law. Consequently, the income levels where the 0%, 15%, and 20% long-term capital gain rates apply have changed very little as a result of the New Law. Caution! The New Law did not change the 3.8% Net Investment Income Tax on investment income (e.g., capital gains, dividends, passive income) which will continue to apply once the modified adjusted gross income of married taxpayers filing jointly exceeds $250,000 (exceeds $200,000 if single). Repeal Of Personal Exemption Deduction. Starting in 2018, the New Law repeals the personal exemption deduction for taxpayers and their dependents. Increased Standard Deduction. The New Law increases the Standard Deduction to the following levels for 2018: Joint Return – $24,000 (up from $13,000); Single – $12,000 (up from $6,500); and Head-of-Household – $18,000 (up from $9,550). Enhanced Child Credit. For 2017, subject to certain income phase-out thresholds, individuals were allowed a child credit of $1,000 for each “Qualifying Child” who had not reached age 17 by the end of the tax year. Starting in 2018, the New Law increases the child credit for each “Qualifying Child” (as defined under prior law) to $2,000. Under the New Law, this child credit begins phasing out as the individual’s modified adjusted gross income (MAGI) exceeds the following amounts: Joint Return – $400,000 (up from $110,000); Others – $200,000 (up from $75,000). Also, the New Law allows up to $1,400 (up from $1,000) of the child credit to be “refundable” to the extent of 15% of the taxpayer’s earned income in excess of $2,500 (down from $3,000). A “refundable” credit generally means to the extent the credit exceeds the taxes you would otherwise owe with your individual income tax return without the credit, the IRS will send you a check for the excess. Net $500 Credit. The New Law creates a new non-refundable credit of $500 for each person the taxpayer could have claimed as a dependent under prior law but who is not a Qualifying Child (e.g., a “Qualifying Relative” as defined under prior law). This $500 credit is added to any other child tax credits and the total credits begin phasing out once a taxpayer’s MAGI exceeds $400,000 on a joint return or $200,000 for singles. Changes To The Alternative Minimum Tax For Individuals. Although the New Law retains the “Alternative Minimum Tax” (AMT) for individual taxpayers, it offers new relief from the AMT by increasing the AMT Exemption amounts and repealing or limiting certain deductions that could have triggered the AMT under prior law. With these changes, it is expected that fewer individuals will be subject to the AMT after 2017. Repeal Of The Deduction For Qualified “Moving Expenses.” Under prior law, the deduction for qualified “Moving Expenses” was an above-the-line deduction. Starting in 2018, the New Law repeals the deduction for “Moving Expenses” except for members of the Armed Forces who move pursuant to military orders. Likewise, an employer is no longer allowed to reimburse an employee’s moving expenses on a tax-free basis except for these qualifying members of the Armed Forces. Repeal Of Deduction For Qualified “Alimony Payments.” Currently, an individual making qualified alimony payments is allowed an “above-the-line” deduction for the payments and the recipient of the payments must include the payments in income. Effective for “Divorce or Separation Instruments” executed after 2018, the New Law repeals altogether the deduction for alimony payments, and the alimony payments will no longer be taxable to the payee. If the divorce instrument is executed before 2019, but modified after 2018, the alimony payments made after the modification will continue to be deductible by the individual making the payments (and taxable to the recipient) unless the modification expressly provides that the alimony payments are to be nondeductible to the payer and taxable to the recipient. New Limitations For And Repeal Of Certain “Itemized Deductions.” “Itemized Deductions” (i.e., below-the-line deductions) do not reduce your AGI or MAGI, but may still provide tax savings if they exceed in the aggregate your Standard Deduction. Since the New Law substantially increases the Standard Deduction, it will take a larger amount of itemized deductions to generate a tax benefit after 2017. However, the New Law not only increases the amount of the Standard Deduction, it also repeals or places new limits on several popular itemized deductions. Consequently, it is anticipated that fewer individuals will “itemize” deductions under the New Law. New Limits On The Home Mortgage Interest Deduction. For 2017, individuals are generally allowed an itemized deduction for home mortgage interest paid on up to $1,000,000 ($500,000 for married individuals filing separately) of “Acquisition Indebtedness” (i.e., Funds borrowed to purchase, construct, or substantially improve your principal or second residence and secured by that residence). For tax years beginning after 2017, the New Law reduces the dollar cap from $1,000,000 to $750,000 ($375,000 for married filing separately) for “Acquisition Indebtedness” incurred after December 15, 2017. The $1,000,000 cap remains for “Acquisition Indebtedness” incurred on or before December 15, 2017. Special Rule When Refinancing Acquisition Indebtedness. Subject to limited exceptions, the refinancing of Acquisition Indebtedness is generally deemed to have been incurred on the date of the original indebtedness. So, for example, if a taxpayer incurred Acquisition Indebtedness on or before December 15, 2017, the refinancing of that indebtedness after December 15, 2017 will still be entitled to the $1,000,000 cap (to the extent of the outstanding balance of the original Acquisition Indebtedness on the date of the refinancing). Repeal Of Interest Deduction For “Home Equity Indebtedness.” For tax years beginning after 2017, taxpayers may not deduct interest with respect to “Home Equity Indebtedness” (i.e., Up to $100,000 of funds borrowed that do not qualify for “Acquisition Indebtedness” but are secured by your principal or second residence). Unlike the interest deduction for “Acquisition Indebtedness,” the New Law does not grandfather an interest deduction for “Home Equity Indebtedness” that was outstanding before 2018. Qualified Second Residence Still Allowed. The New Law did not change the rule that Acquisition Indebtedness can be incurred with respect to your qualified “Second Residence” (as well as your “principal residence”). New Limitation On The “State And Local” Tax Deduction. Starting in 2018, the aggregate itemized deduction for state and local real property taxes, state and local personal property taxes, and state and local income taxes (or sales taxes if elected) is limited to $10,000 ($5,000 for married filing separately). However, deductions continue to be allowed for state, local, and foreign “property” taxes, and “sales” taxes paid or incurred in carrying on the taxpayer’s trade or business (e.g., taxpayer’s Schedule C, Schedule E, or Schedule F operations) or in connection with the taxpayer’s production of income. Changes To The Charitable Contribution Deduction. The New Law retains the charitable contribution deduction with the following changes starting in 2018: 1) The 50% AGI limitation under prior law for cash contributions to public charities and certain other organizations is increased to 60%, and 2) A charitable contribution deduction is no longer allowed for contributions made to colleges and universities in exchange for the contributor’s right to purchase tickets or seating at an athletic event (prior law allowed the taxpayer to deduct 80% as a charitable contribution). Modifications To The Deduction For Qualified Medical Expenses. The New Law generally retains the existing rules for medical expense deductions. However, for tax years beginning in 2017 and 2018, for both regular tax purposes and AMT purposes, a taxpayer may deduct medical expenses to the extent they exceed 7.5% (down from 10%) of his or her AGI. The 7.5% threshold reverts back to 10% after 2018. Elimination Of 3% Phase-Out Of Itemized Deductions. For 2017, most itemized deductions began phasing out using a 3% phase-out rate once an individual’s adjusted gross income (AGI) exceeds a certain amount. Starting in 2018, the New Law repeals this 3% phase-out rule. Repeal Of Miscellaneous Itemized Deductions Subject To The 2% Of AGI Reduction. For 2017, certain “miscellaneous itemized deductions” (e.g., un-reimbursed employee business expenses, certain investment expenses) were allowed only to the extent they exceeded in the aggregate 2% of the taxpayer’s adjusted gross income (AGI). Starting in 2018, the New Law not only repeals this 2% reduction rule, but also repeals the deduction for “Miscellaneous Itemized Deductions” that were subject to the 2% of AGI reduction. Planning Alert! Under the New Law, employee business expenses that are not properly reimbursed by the employer under an accountable reimbursement arrangement are classified as Miscellaneous Itemized Deductions and, therefore, are not deductible after 2017. However, if any of these employee business expenses are reimbursed under your employer’s accountable reimbursement arrangement, your employer will get a deduction for the reimbursement, and you will not be taxed on the reimbursement. Recharacterization Of Roth IRA Conversions No Longer Allowed. Starting in 2018, the New Law prohibits recharacterizations of the conversion of a traditional IRA to a Roth IRA. Penalty For Failure To Purchase Health Care Coverage Repealed After 2018. Starting in 2019, the New Law essentially eliminates the penalty for failure to purchase qualified health coverage by reducing the “Shared Responsibility Tax” (SR Tax) to zero. Planning Alert! The SR Tax for failure to purchase qualified health care coverage continues to apply for 2017 and 2018, unless an exemption from the tax applies. 529 Plans Allowed To Pay K-12 Tuition. Starting in 2018, the New Law allows 529 plans to pay up to $10,000 per year of qualified tuition in connection with the enrollment or attendance of the designated beneficiary at a public, private, or religious elementary or secondary school. Caution! This annual $10,000 limitation applies on a per-student basis. Thus, an individual who is a designated beneficiary of multiple §529 plans may receive total distributions for K-12 expenses during a taxable year of no more than $10,000. Current Unified Estate Tax Exclusion Amount And GST Exemption Amount Doubled. Effective for individuals dying and generation‑skipping transfers after 2017 and before 2026, the New Law increases the Basic Unified Exclusion Amount for gift and estate tax purposes and the generation‑skipping exemption amount to $10,000,000 (as indexed for inflation [i.e, $11,200,000 for 2018]). Previously, the exclusion and exemption amounts for 2018 were scheduled to be $5,600,000. Reduction In Corporate Tax Rate. For tax years beginning after 2017, the New Law provides for a flat tax rate of 21% (down from a top 35% rate) for regular “C” corporations. “Personal Service Corporations” (PSCs) are also subject to the flat 21% tax rate (down from a 35% flat tax rate). A PSC is generally a “C” corporation that is primarily in the business of providing services in the areas of health, law, accounting, engineering, architecture, actuarial sciences, performing arts, or consulting. Repeal Of Corporate Alternative Minimum Tax (AMT). The New Law repeals the corporate AMT for tax years beginning after 2017. A corporation will be allowed a refundable credit for each of the tax years beginning in 2018, 2019, and 2020 equal to 50% of unused AMT credit carryovers to those respective years in excess of the regular tax for those years. Any AMT credit carryover amount that remains unused after applying it to the 2021 regular tax is 100% refundable. Background. Effective for tax years beginning after 2017, the New Law creates a new 20% deduction that is generally provided to noncorporate taxpayers receiving certain qualifying income. Planning Alert! Although not discussed in detail in this letter, a similar 20% deduction is allowed to certain agricultural and horticultural cooperatives that satisfy specific criteria. Caution! While most new tax provisions primarily impacting businesses under the New Law do not have an expiration date, this 20% deduction does expire after 2025! Income Qualifying For The 20% Deduction. The following types of income generated by partnerships, S corporations, sole proprietorships, trusts, and estates may qualify for the 20% deduction: “Qualified Business Income,” “Qualified Cooperative Dividends,” “Qualified REIT Dividends,” and “Qualified Publically-Traded Partnership Income.” Please note that, of these four types of qualifying income, the most common will, in all likelihood, be “Qualified Business Income” (QBI). Consequently, the remainder of this discussion focuses only on QBI. “Qualified Business Income.” “Qualified Business Income” (QBI) is generally defined as the net amount of qualified items of income, gain, deduction, and loss with respect to “any” trade or business other than: 1) Certain personal service businesses known as “Specified Service Trade Or Businesses” (described in more detail below), and 2) The trade or business of performing services “as an employee.” QBI does not include: 1) Dividends, investment interest income, short‑term capital gains, long‑term capital gains, income from annuities, commodities gains, foreign currency gains, etc., 2) Reasonable compensation paid by a qualified trade of business for services rendered to the taxpayer claiming the 20% deduction, 3) Any “guaranteed payment” paid to a partner for services actually rendered to or on behalf of the partnership, or 4) To the extent provided in regulations, any amount allocated or distributed by a partnership to a partner who is acting other than in his or her capacity as a partner for services rendered to a partnership. The Amount Of The 20% Deduction. The amount of the 20% deduction with respect to Qualified Business Income is generally the lesser of: 1) 20% of the owner’s share of “Qualified Business Income” (QBI) from the owner’s interest in each “Qualified Trade or Business,” or 2) The owner’s share of the W-2 Wage and Capital Limitation (if applicable) for each such trade or business interest. The aggregate 20% deduction for QBI also cannot exceed 20% of the excess of the taxpayer’s “taxable income” over the taxpayer’s “net capital gains.” Caution! Although we do not discuss the detailed workings of the “W-2 Wage and Capital Limitation” in this letter, this limitation is generally designed to ensure that the maximum 20% deduction is available only to qualified businesses that have sufficient W-2 wages, sufficient tangible depreciable business property, or both. Also, otherwise qualifying owners of pass-through entities are entirely exempt from the W‑2 Wage And Capital Limitation if the owner’s “taxable income” (computed without regard to the 20% deduction) does not exceed $157,500 or $315,000 (if filing jointly). However, the Wage and Capital Limitation phases in as an owner’s taxable income goes from more than $157,500 to $207,500 or from more than $315,000 to $415,000 (if filing jointly). “Specified Service Trade Or Businesses” Generally Do Not Qualify For The 20% Deduction Unless Owner’s Taxable Income Less Than $415,000/$207,500. A “Specified Service Trade or Business” (SSTB) generally does not qualify for the 20% deduction. An SSTB is any trade or business activity involving the performance of services in the fields of health, law, accounting, actuarial science, performing arts, consulting, athletics, financial services, brokerage services, any trade or business where the principal asset of such trade or business is the reputation or skill of one or more of its employees, or any trade or business involving the services of investing and investment management, trading, or dealing in securities, partnership interests, or commodities. Note! An “SSTB” does not include the performance of architectural or engineering services. Planning Alert! The 20% deduction is allowed for an owner of an SSTB if the owner’s “taxable income” (computed without regard to the 20% deduction) does not exceed $157,500 or $315,000 (if filing jointly). The deduction is phased-out as an owner’s taxable income goes from more than $157,500 to $207,500 or from more than $315,000 to $415,000 (if filing jointly). Other Rules. The 20% deduction: 1) Does not reduce the owner’s “self-employment” income for purposes of determining S/E Tax, 2) Does not reduce the owner’s “adjusted gross income” (AGI), although it does reduce the owner’s “taxable income,” and 3) Is available to taxpayers using the standard deduction. 100% First-Year 168(k) Bonus Depreciation Deduction. For the past several years, one of the most popular tax-favored deductions has been the 168(k) Bonus Depreciation deduction. Under prior law, the 168(k) deduction was equal to 50% of the cost of qualifying “new” depreciable assets placed-in-service during 2017, and was scheduled to drop to 40% for 2018. However, the New Law increases the 168(k) Bonus Depreciation deduction to 100% for qualifying new and “used” property acquired and placed-in-service after September 27, 2017 and before January 1, 2023. Therefore, under the New Law, property that generally qualifies for the 168(k) Bonus Depreciation includes “new” or “used” business property that has a depreciable life for tax purposes of 20 years or less (e.g., machinery and equipment, furniture and fixtures, sidewalks, roads, landscaping, computers, computer software, farm buildings, and qualified motor fuels facilities). Business Vehicles. Vehicles used primarily in business generally qualify for the 168(k) Bonus Depreciation. However, there is a dollar cap imposed on business cars and trucks that have a loaded vehicle weight of 6,000 lbs or less. More specifically, vehicles acquired and placed-in-service in 2017 and used 100% for business are generally allowed maximum depreciation (including the Section 179 deduction as discussed below) of $3,160 ($3,560 for trucks and vans) for 2017. However, these caps are increased by $8,000 (i.e., to $11,160 and $11,560 for trucks and vans) for qualifying vehicles. For qualifying vehicles acquired and placed-in-service after September 27, 2017, the New Law retains this $8,000 increase through 2022. Moreover, for qualifying vehicles placed-in-service after 2017, the New Law increases the annual depreciation caps (without regard to the $8,000 increase) as follows: 1st year ‑ $10,000 (up from $3,160 if placed-in-service in 2017); 2nd year ‑ $16,000 (up from $5,100); 3rd year ‑ $9,600 (up from $3,050); fourth and subsequent years ‑ $5,760 (up from $1,875). Expansion Of The 179 Deduction. Effective for property placed-in-service in tax years beginning after 2017, the New Law increases the 179 Deduction limitation to $1,000,000 (up from $510,000 for 2017) and increases the phase‑out threshold to $2,500,000 (up from $2,030,000 for 2017). These caps are to be indexed for inflation after 2018. Also, the $25,000 cap for SUVs remains, but will be indexed for inflation beginning in 2019. In addition, prior law did not allow the 179 deduction for property used in connection with lodging (other than hotels, motels, etc.). Effective for property placed-in-service in tax years beginning after 2017, the New Law removes this restriction, so the 179 Deduction is now allowed for otherwise qualifying property used in connection with lodging. Moreover, effective for property placed-in-service in tax years beginning after 2017, the New Law allows the 179 Deduction for: 1) “Qualified Improvement Property” (which is generally an improvement to the interior portion of a commercial building [provided the improvement is not attributable to an enlargement of the building, elevators or escalators, or the internal structural framework of the building], if the improvement is placed‑in‑service after the building was first placed‑in‑service), and 2) “Specified Improvements To Commercial Real Property” (which generally include any of the following improvements to nonresidential real property placed‑in‑service after the date such property was first placed‑in‑service: Roofs; Heating, ventilation, and air‑conditioning property; Fire protection and alarm systems; and Security systems). Simplified Accounting For Certain Small Businesses. Generally effective for tax years beginning after 2017, the New Law provides the following accounting method relief for qualifying businesses: 1) Increases the average gross receipts (for the past three years) safe harbor for “C” corporations to use the cash method of accounting from $5 million to $25 million, 2) Generally allows businesses with average gross receipts (AVGRs) for the preceding three tax years of $25 million or less to use the cash method even if the business has inventories, 3) Generally allows simplified methods for accounting for inventories for businesses with AVGRs for the preceding three tax years of $25 million or less, 4) Generally exempts businesses with AVGRs for the preceding three tax years of $25 million or less from applying UNICAP, and 5) Liberalizes the availability of the completed contract method for certain businesses with AVGRs for the preceding three tax years of $25 million or less. New Limits On Business Interest. Effective for tax years beginning after 2017, the New Law generally provides that businesses may not deduct interest expense for a taxable year in excess of 1) Interest income, plus 2) 30% of the business’s adjusted taxable income, plus 3) Floor plan financing interest. Any excess is carried over to subsequent years for an unlimited number of years. The New Law also generally exempts businesses with Average Gross receipts for the preceding three tax years of $25 million or less from this new interest expense deduction limitation. Modifications To The NOL Deduction. The New Law generally makes the following changes to the NOL deduction: 1) For net operating losses (NOLs) arising in tax years beginning after 2017, repeals the prior law 20-year limitation on the number of years to which an NOL could be carried forward; 2) Net operating losses (NOLs) arising in tax years beginning after 2017 and carried to future years will not be allowed to offset more than 80% of taxable income before the NOL deduction; and 3) For net operating losses (NOLs) arising in tax years beginning after 2017, repeals the ability to carry back an NOL to previous years, except the New Law allows NOLs attributable to certain farming businesses and certain property and casualty insurance companies to be carried back to the 2 prior tax years. Repeal Of Section 199 Deduction For Income Attributable To Domestic Production Activities. The New Law generally repeals the deduction for domestic production activities for taxpayers other than C corporations, effective for tax years beginning after December 31, 2017. The New Law repeals the deduction for domestic production activities for C corporations for tax years beginning after December 31, 2018. Repeal Of Deductions For Certain Entertainment, Amusement, Recreation Activities, Membership Dues, Etc. Effective for amounts paid or incurred after 2017, the New Law repeals all deductions with respect to: 1) An activity generally considered to be entertainment, amusement or recreation, 2) Membership dues with respect to any club organized for business, pleasure, recreation or other social purposes, or 3) A facility or portion of a facility used in connection with any of the above. Planning Alert! The New Law did not repeal the deduction for 50% of food and beverage expenses associated with operating a trade or business (e.g., meals consumed by employees during away from home travel). Changes For Meals Provided To Employees On Employer’s Premises. Under prior law, an employer could generally deduct 100% of the cost of business meals that were excludable from the income of employees because they were provided at an employer‑operated eating facility for the convenience of the employer. Effective for amounts incurred and paid after 2017 and before 2026, the employer may deduct only 50% (down from 100%) of these employer-provided meals at an employer‑operated eating facility (after 2025 the New Law repeals this deduction altogether). 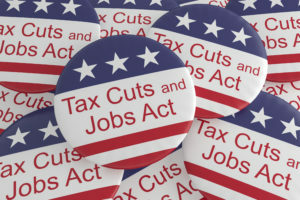 The Tax Cuts And Jobs Act Of 2017 is mammoth in its scope and reach, and we have attempted to discuss only selected provisions that we believe will have the greatest impact on the largest number of our clients. If you have heard of a provision in the New Law that we did not address in this letter (or if you want additional information on a topic we did discuss), please contact us. In addition, please call us before implementing any planning ideas discussed in this letter, or if you need additional information. Note! The information contained in this material represents a general overview of selected provisions in the Tax Cuts And Jobs Act Of 2017 and should not be relied upon without an independent, professional analysis of how any of the items discussed may apply to a specific situation.